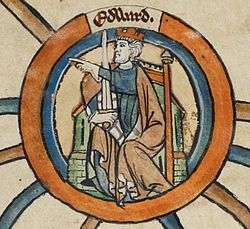 Edward the Elder (Old English: Eadweard cyning; c. 874–877 – 17 July 924) was King of the Anglo-Saxons from 899 until his death. He became king in 899 upon the death of his father, Alfred the Great. His court was at Winchester, previously the capital of Wessex. He captured the eastern Midlands and East Anglia from the Danes in 917 and became ruler of Mercia in 918 upon the death of Æthelflæd, his sister. All but two of his charters give his title as "Anglorum Saxonum rex" or "king of the Anglo-Saxons". He was the second king of the Anglo-Saxons as this title was created by Alfred. Edward's coinage reads "EADVVEARD REX." The chroniclers record that all England "accepted Edward as lord" in 920. But the fact that York continued to produce its own coinage suggests that Edward's authority was not accepted in Viking-ruled Northumbria. Edward's eponym "the Elder" was first used in Wulfstan's Life of St Æthelwold (c. 996) to distinguish him from the later King Edward the Martyr. At the time of Alfred the Great's death, there were a number of Æthelings – princes of the West Saxon dynasty who were eligible for the throne. Edward was the second surviving child and elder son of Alfred the Great and his Mercian queen, Ealhswith. Edward's birth cannot be dated with certainty, but it was in the 870s. His parents married in 868 and he led troops into battle in 893. The chronicle of Peter of Langtoft (died c.1308, and hence writing several centuries later) called him, "[v]ery strong and handsome, and of great intelligence." Asser's Life of King Alfred reports that Edward was educated at court together with his youngest sister Ælfthryth. His second sister, Æthelgifu, was intended for a life in religion from an early age (it was customary during much of the Middle Ages for noble families to "give" one child to the Church) and was later abbess of Shaftesbury. The youngest sibling, Æthelweard, was educated at a court school where he learned Latin, which suggests that he too was intended for a religious life. Edward and Ælfthryth, however, while they learned the English of the day, received a courtly education, and Asser refers to their taking part in the "pursuits of this present life which are appropriate to the nobility". The first appearance of Edward in the sources is in 892, in a charter granting land at North Newnton, near Pewsey in Wiltshire, to ealdorman Æthelhelm, where he is called filius regis, the king's son. Although he was the reigning king's elder son, Edward was not certain to succeed his father. Until the 890s, the obvious heirs to the throne were Edward's cousins Æthelwold and Æthelhelm, sons of Æthelred, Alfred's older brother and predecessor as king. Æthelwold and Æthelhelm were around ten years older than Edward. Æthelhelm disappears from view in the 890s, seemingly dead, but a charter probably from that decade shows Æthelwold witnessing before Edward, and the order of witnesses is generally believed to relate to their status. As well as his greater age and experience, Æthelwold may have had a matrilineal advantage over Edward where the succession was concerned. While Alfred's wife Ealhswith is never described as queen and was never crowned, Æthelwold and Æthelhelm's mother Wulfthryth was called queen. In 901, Æthelwold came with a fleet to Essex, and encouraged the Danes in East Anglia to rise up. In the following year he attacked English Mercia and northern Wessex. Edward retaliated by ravaging East Anglia, but when he retreated south the men of Kent disobeyed the order to retire, and were intercepted by the Danish army. The two sides met at the Battle of the Holme on 13 December 902. According to the Anglo-Saxon Chronicle, the Danes "kept the place of slaughter", but they suffered heavy losses, including Æthelwold and a King Eohric, possibly of the East Anglian Danes. Relations with the North proved problematic for Edward for several more years. The Anglo-Saxon Chronicle mentions that he made peace with the East Anglian and Northumbrian Danes "of necessity". There is also a mention of the regaining of Chester in 907, which may be an indication that the city was taken in battle. In 909, Edward sent an army to harass Northumbria. In the following year, the Northumbrians retaliated by attacking Mercia, but they were met by the combined Mercian and West Saxon army at the Battle of Tettenhall, where the Northumbrian Danes were destroyed. From that point, they never raided south of the River Humber. Edward then began the construction of a number of fortresses (burhs), at Hertford, Witham and Bridgnorth. He is also said to have built a fortress at Scergeat, but that location has not been identified. This series of fortresses kept the Danes at bay. Other forts were built at Tamworth, Stafford, Eddisbury and Warwick. These burhs were built to the same specifications (within centimetres) as those within the territory that his father had controlled; it has been suggested on this basis that Edward actually built them all. Edward extended the control of Wessex over the whole of Mercia, East Anglia and Essex, conquering lands occupied by the Danes and bringing the residual autonomy of Mercia to an end in 918, after the death of his sister, Æthelflæd. Æthelflæd's daughter, Ælfwynn, was named as her successor, but Edward deposed her, bringing Mercia under his direct control. He had already annexed the cities of London and Oxford and the surrounding lands of Oxfordshire and Middlesex in 911. The first half of the tenth century was critical in the development of the shire as principal administrative unit in England, and Edward was probably responsible for shiring Mercia and the eastern Danelaw. By 918, all of the Danes south of the Humber had submitted to him. By the end of his reign, the Norse, the Scots and the Welsh had acknowledged him as "father and lord". This recognition of Edward's overlordship in Scotland led to his successors' claims of suzerainty over that Kingdom. In the view of F. T. Wainwright: "Without detracting from the achievements of Alfred, it is well to remember that it was Edward who reconquered the Danish Midlands and gave England nearly a century of respite from serious Danish attacks." Edward reorganized the Church in Wessex, creating new bishoprics at Ramsbury and Sonning, Wells and Crediton. Despite this, there is little indication that Edward was particularly religious. In fact, the Pope delivered a reprimand to him to pay more attention to his religious responsibilities. Edward probably divided the West Midlands into shires between 919 and 924, ignoring traditional regional and tribal boundaries. His rearrangement aroused Mercian opposition, and he died leading an army against a rebellion by the garrison at Chester in alliance with the Welsh, on 17 July 924 at Farndon-Upon-Dee and was buried in the New Minster in Winchester, Hampshire, which he himself had established in 901. After the Norman Conquest, the minster was replaced by Hyde Abbey to the north of the city and Edward's body was transferred there. His last resting place is currently marked by a cross-inscribed stone slab within the outline of the old abbey marked out in a public park. Edward's eponym the Elder was first used in the 10th century, in Wulfstan's Life of St Æthelwold, to distinguish him from the later King Edward the Martyr. Edward had four siblings, including Æthelflæd, Lady of the Mercians, and Ælfthryth, Countess of Flanders. King Edward had about fourteen children from three marriages (or according to some sources, an extramarital relationship and two marriages). A daughter who married Sihtric Cáech, Viking king of Dublin and then of York (alternatively daughter by one of his other wives). Ælfweard of Wessex (904–924), whose death occurred 16 days after Edward's. Later sources sometimes portray him as Edward's successor, at least in part of the kingdom. Eadgifu, married "Louis, Prince of Aquitaine", whose identity is disputed, as is the very existence of this daughter. Eadgifu outlived her husband and her sons, and was alive during the reign of her grandson, King Edgar. William of Malmsbury's history De antiquitate Glastonie ecclesiae claims that Edward's second wife, Ælfflæd, was also alive after Edward's death, but this is the only known source for that claim. ↑ The twelfth century chonicler Ralph of Diceto stated that the coronation took place at Kingston, a claim which was accepted by Simon Keynes, but Sarah Foot thought Winchester more likely. 1 2 Simon Keynes; Higham (2001), p. 57. ↑ Oxford Dictionary of National Biography; Yorke; Asser, c. 75. ↑ Oxford Dictionary of National Biography; PASE; S 348; Yorke. ↑ Oxford Dictionary of National Biography; S 356; Yorke. ↑ Asser, c. 13; S 340; Yorke. Check Stafford, "King's wife". ↑ "Edward the Elder: Reconquest of the Southern Danelaw". ↑ "Edward the Elder: "Father and Lord" of the North". ↑ "English Monarchs: Edward the Elder". ↑ Barbara Yorke; Higham (2001) pp. 25–26. ↑ "Edward the Elder, king of the Anglo-Saxons". ↑ Lappenberg (1845), pp. 98–99. 1 2 Lappenberg (1845), p.99. 1 2 Poole April 1911, p. 310. ↑ Crofton, Ian (2006). The Kings & Queens of England. Quercus Publishing. p. 8. ISBN 978 1 84724 628 8. ↑ Poole April 1911, p. 313. ↑ Romsey Abbey. Pitkin Publishing. 2011. ISBN 978-1-84165-357-0. Higham, N. J.; Hill, D. H., eds. (2001). Edward the Elder, 899–924. Barbara Yorke, Simon Keynes. London: Routledge. ISBN 0-415-21497-1. Lappenberg, Johann; Benjamin Thorpe, translator (1845). A History of England Under the Anglo-Saxon Kings. J. Murray. Poole, Reginald L. (April 1911). "Burgundian Notes". The English Historical Review. 26 (102): 310–317. doi:10.1093/ehr/xxvi.cii.310. Williams, Ann (1982). "Princeps Merciorum Gentis: the Family, Career and Connections of Ælfhere, Ealdorman of Mercia 956-983". Anglo-Saxon England. Cambridge, UK: Cambridge University Press. 10. doi:10.1017/s0263675100003240. ISBN 0 521 24177 4. Yorke, Barbara (2001). "Edward as Ætheling". In Higham, Nick; Hill, David. Edward the Elder 899–924. Abingdon, UK: Routledge. pp. 25–39. ISBN 0-415-21497-1. Smyth, Alfred P. (1996-03-14). King Alfred the Great. Oxford University Press. ISBN 978-0-19-822989-6.